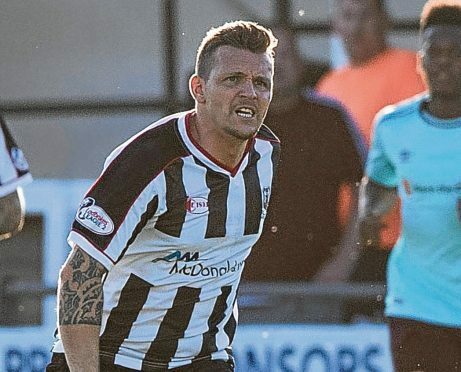 Elgin City captain Jon-Paul McGovern hopes the Black and Whites’ challenging Betfred Cup group can serve as good preparation for their League 2 campaign. Gavin Price’s make the trip to Ross County, who were relegated from the Premiership last season, for their first Group A fixture today. Elgin travel to League 1 side Arbroath next weekend, with home fixtures against Championship sides Alloa Athletic and Dundee United the following week. Midfielder McGovern knows the pressure is off his side, as they look towards their opening league fixture away to Annan Athletic on August 4. McGovern said: “I don’t think anybody looking at our group will be thinking we are going to be winning any of our games. “This weekend we are taking on a full-time team that is just back from Holland, whereas we are a part-time club that trains twice a week, however we can fit that around work commitments. “We know it’s a really tough game. Looking at Ross County’s squad, the signings they have made have been very good. “It seems like they are in a positive frame of mind in terms of planning where they hoping to get to. “They have a big budget for their league, their expectation levels will be pretty high. Vastly-experienced former Celtic and Sheffield Wednesday player McGovern will turn 38 in October, but has opted to remain with City for another season after playing every match last term. McGovern is excited for the new campaign, which will be manager Price’s first full season since succeeding Jim Weir last October. He added: “I am enjoying working with the manager, as well as Keith Gibson. It’s refreshing to work with someone who is very straight laced, who says what he is going to do and does it. “As someone who has seen some of the highs and lows in football that’s quite unique and he does it to the best of his ability. “With the boys we have got and some of the new recruits, hopefully we can put a strong 11 out from the squad we have put together and hopefully we can mount a real challenge in this league.